Head West on I-80 towards Wendover. Take exit 410 in Wendover for US-93. Turn left at the 1st light, then right onto US-93. Drive for 25.6 miles and look for a sign for Ibapah Road and turn left. Stay on this and drive past the tiny town of Gold Hill, UT. 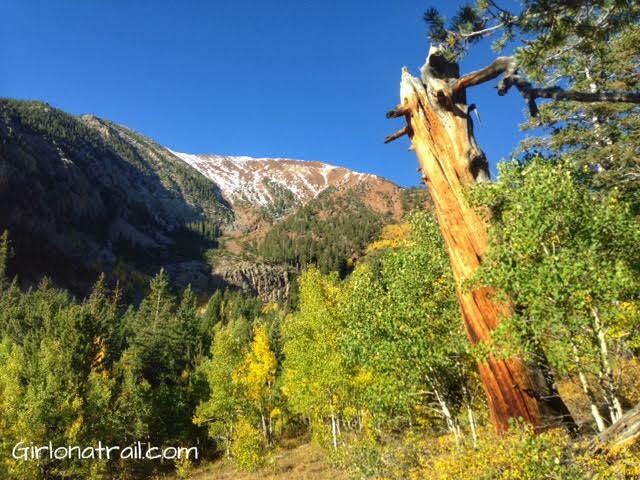 This road turns into the Pony Express-Overland Stage Trail road. Past Callao, UT, turn right onto the "Deep Creek Mtns Road" for about 13 miles, where you'll see a sign for the Granite Creek Road. Follow this road for 4.3 miles to the trailhead. You'll need a high clearance car for this area. Drive up as far as you can, or until you see a possible camp site. Start by walking up the dirt road past your campsite. You'll see these cool, smooth looking rocks on your right. 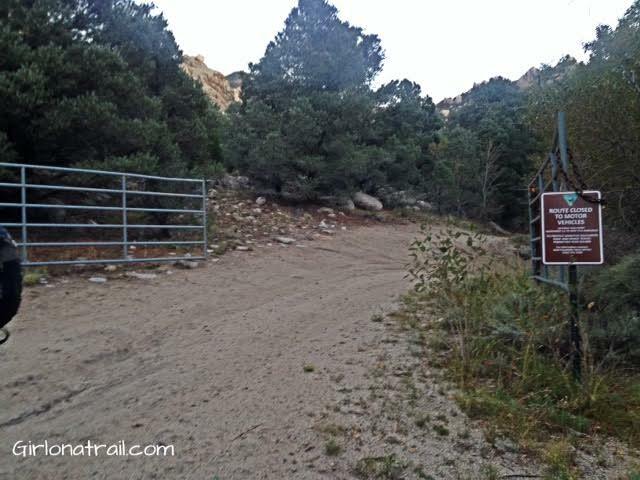 When you pass this gate, is when the "trail" starts, but it's still an old jeep road for the next 2 miles. You'll cross a stream right around the corner from here. We came to what seemed like a 3 way intersection. The guys decide to head up and right. Depending on how much rain this area has seen, these roads may be washed out or muddy. After the jeep road ends, and turns into a trail, keep an eye out for this cairn to your left. You don't want to miss this, or you won't go the right way. Charlie sniffs out the grass. 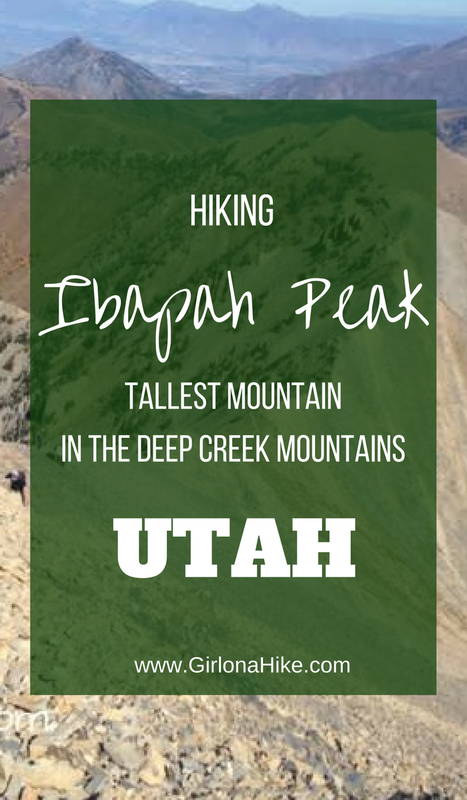 Finally - Ibapah is in sight! This dry stream bed was washed out from a previous rain. Cross over it, then catch the trail again. Now the trail gets really steep, and will stay this way the rest of the hike. 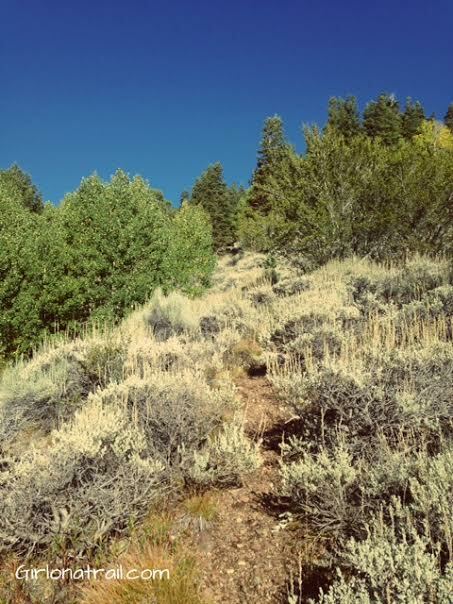 You'll cut through lots of sagebrush on this trail. We came to a small meadow and had a great view of Red Mountain. 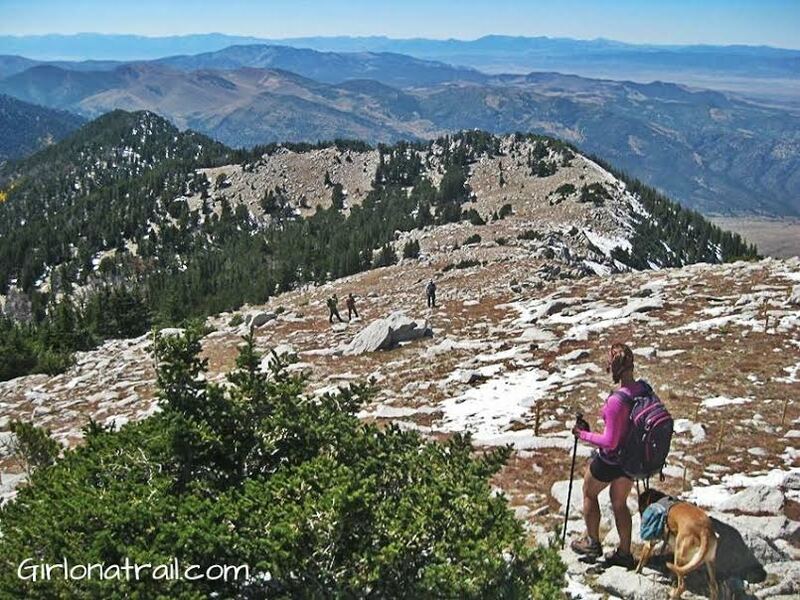 Red Mtn is another peak you can summit, and the elevation is only about 500 ft lower in elevation compared to Ibapah. 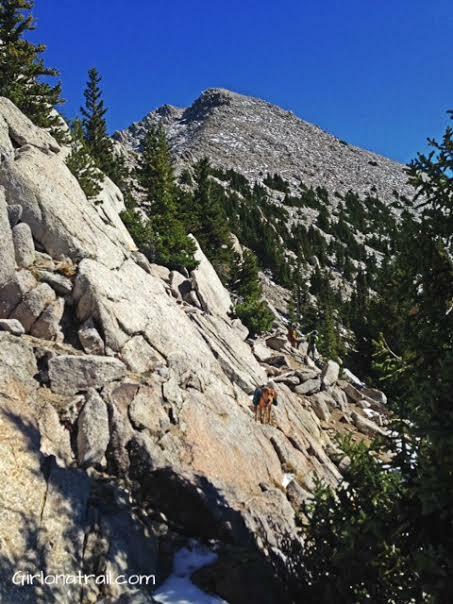 However, the quartzite-clad Red Mtns provide for a cool visual counterbalance to the white granite face of Ibapah Peak. The small meadow below Red Mountain. Finally we reach the large open, dry meadow. This is a great place to take a rest and snack break. You are only halfway there, but by this point have been hiking for aprox. 3 hours. 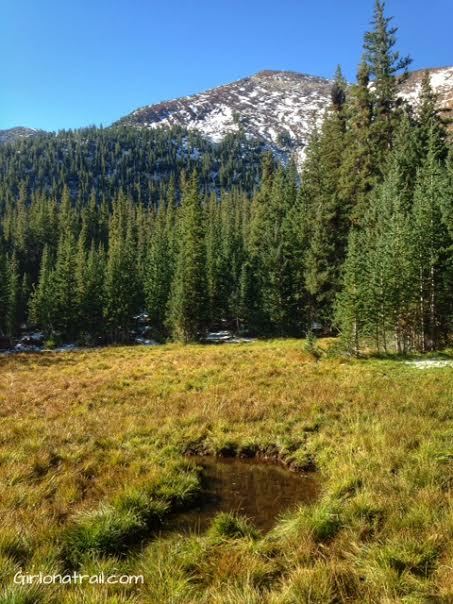 From this meadow, you will want to cut straight across this direction and work your way to the sub peak. There is no trail from this point - just route finding. 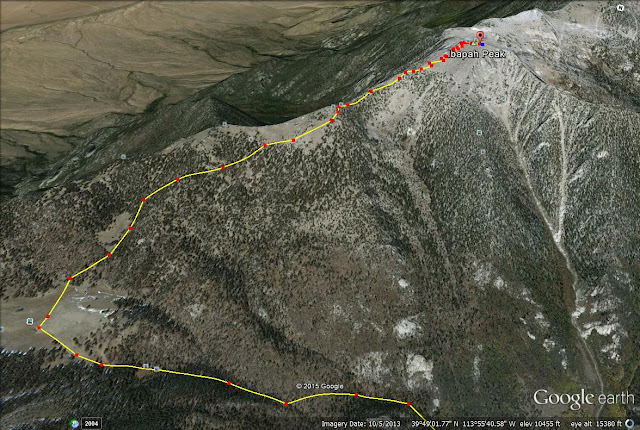 See my map below for how we cut across, and made it to the saddle below Ibapah. Cutting across to the sub peak. Charlie and I make it up the sub peak, and just around the corner to the left is the saddle. It's so close! 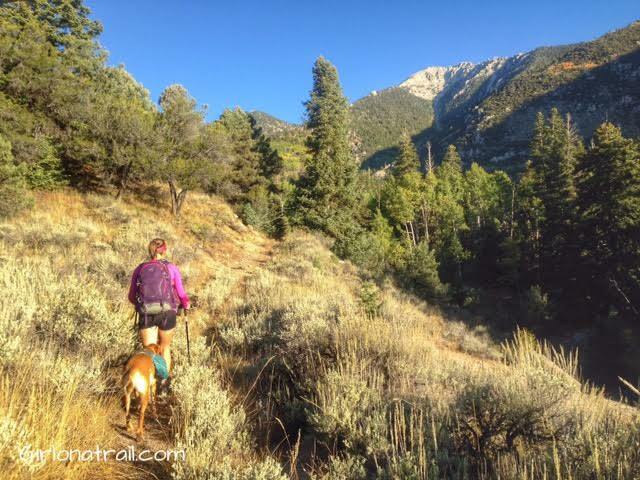 When you work your way from the sub peak to the saddle, you'll see the trail come and go. Sometimes you'll be on the sides of rock walls, however they are totally doable - even Charlie could cut across them. Once you pass the saddle, you'll find the well defined trail. From here it's an "easy" 900 ft to the summit. Since we had already hiked for about 5.5 hours, gained 5,000 ft, and were near an elevation of 11,500 ft we were really slow on this part. Me legs were jelly! It was really cool to see the valley we just hiked up. 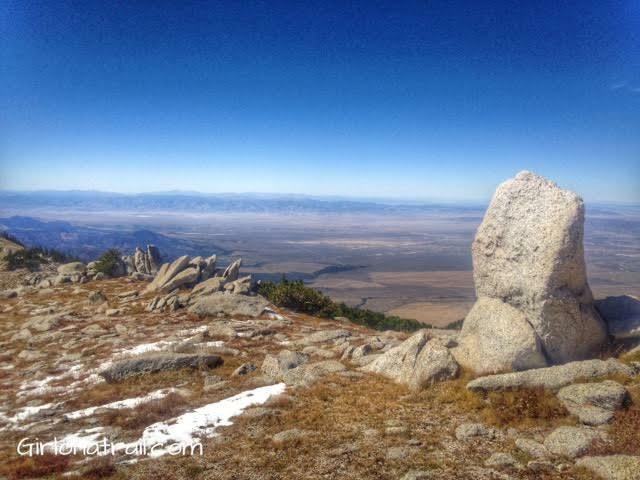 On the summit, with a view of Haystack Peak in the distance. 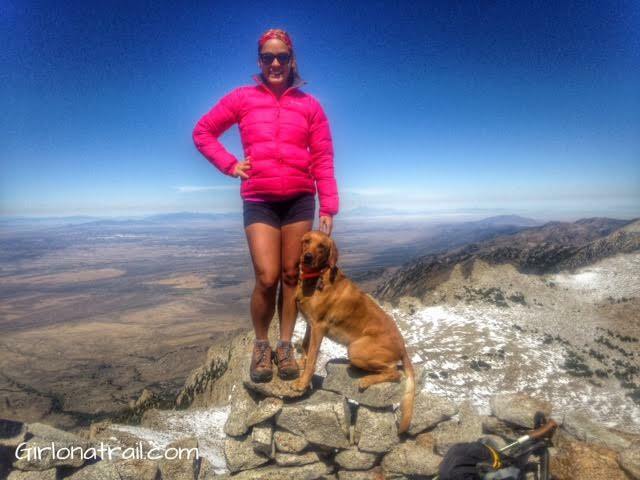 Charlie and I on the summit! He did such a good job, but was definitely tired at the top! He found a warm place to take a quick nap. Looking across to Red Mountain, and the meadow we came from. Time to work our way back down. Going down, we decided to follow the ridge line, until we found a good place to cut back down to the meadow. These rocks along the ridge were really cool, and uniquely formed. Once you get back to the meadow, hike back the same way you came up. Keep in mind that this hike took us roughly 12 hours to complete. The best time of year to hike this is in late August or September. 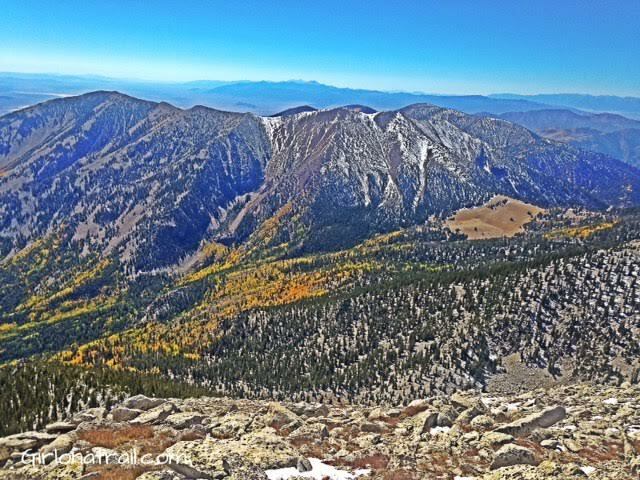 The fall colors are amazing, the temperatures will be cooler, but you may still run into snow at the peak, like we did. 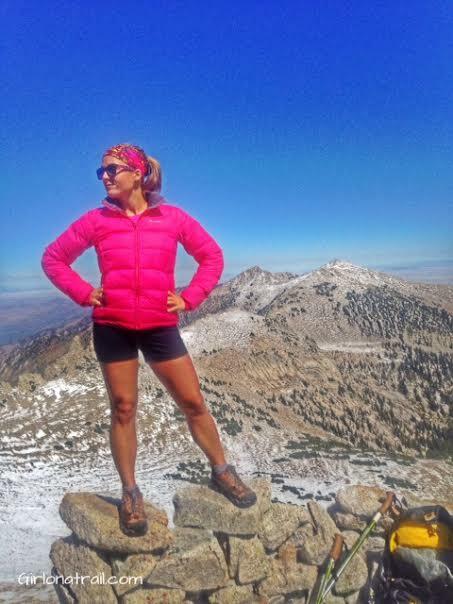 It's an awesome hike, but also one of the toughest peaks I've done. 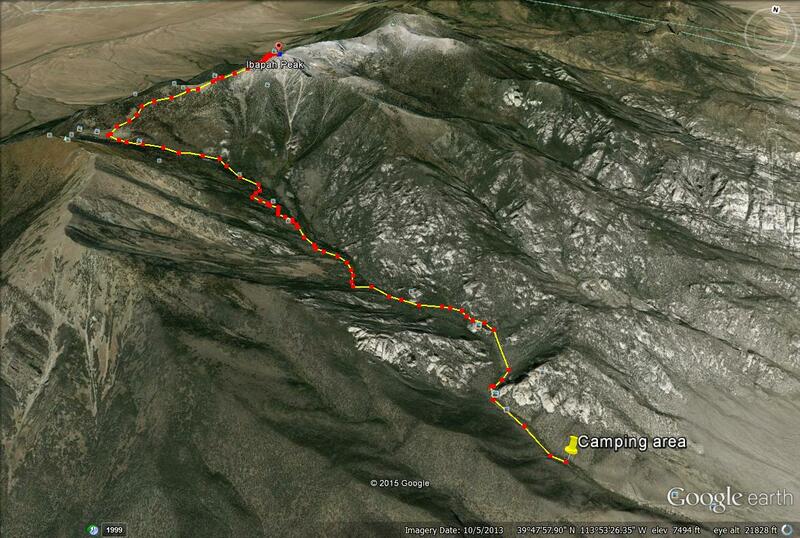 Here is a good aerial map, starting from the camping area. A closer view of the meadow, and how we cut across to the saddle. What an awesome blog you have going on here Alicia! I was googling trail reviews on Ibapah Peak, and stumbled across your website. 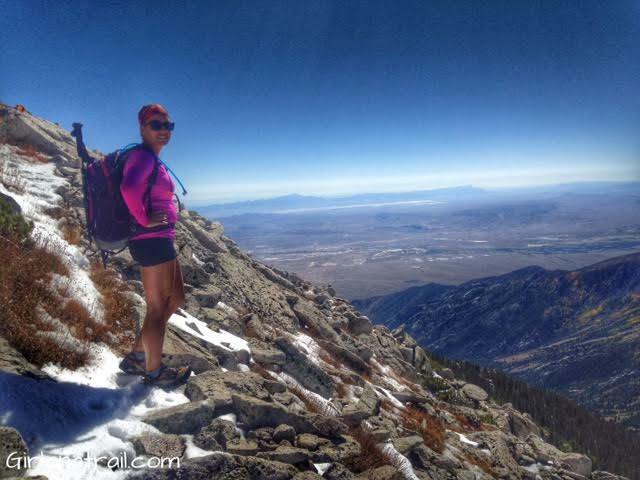 All sorts of great trail reviews and tons of great pictures! You need more pictures of Charlie when he was a puppy though! What a cutie! This peak has been on my to-do list for several years, but I never seem to find the time to get out there. Anyhow, keep up the good work! Ryan Borzea here from Wasatch Peak Baggers. Great website! This peak is one of three my wife and I have left to complete the Utah Ultras. 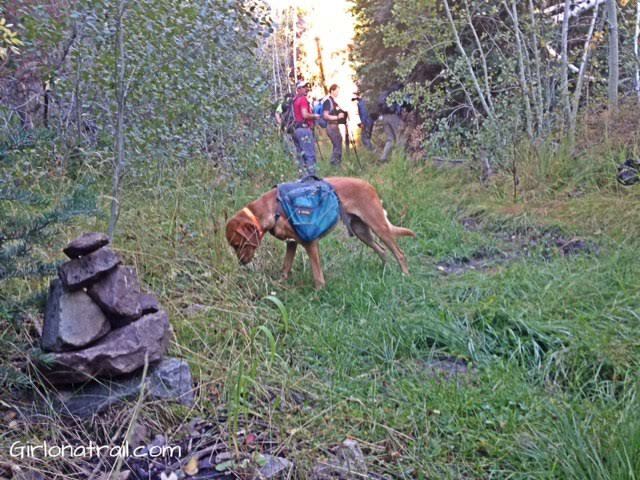 Do you by any chance have the .gpx file from your hike that you'd be willing to share? Great blog! I have so much respect for you, for you to find your own way in the wilderness. I can't even get guys to go with me let alone women. Yeah, I checked into the MeetUp Wasatch hikers etc. 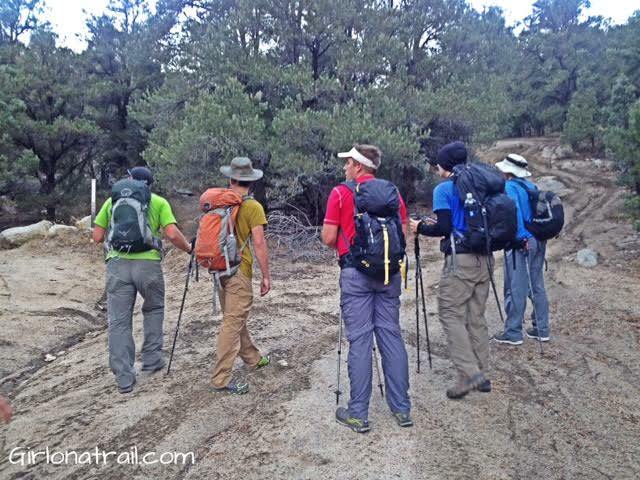 but hiking with 30 other persons on the trail just does not allow one to experience the wonder and solitude that I desire from hiking. I mean, when you are one of amongst 50 people strung out along the trail, what's the point? So, I too have done most of my hiking and back pack trips solo... and you know what? There is nothing wrong with that. As long as you know your limits, carry the essential gear and know to expect the unexpected, solo trips are really, the ultimate back country experience. 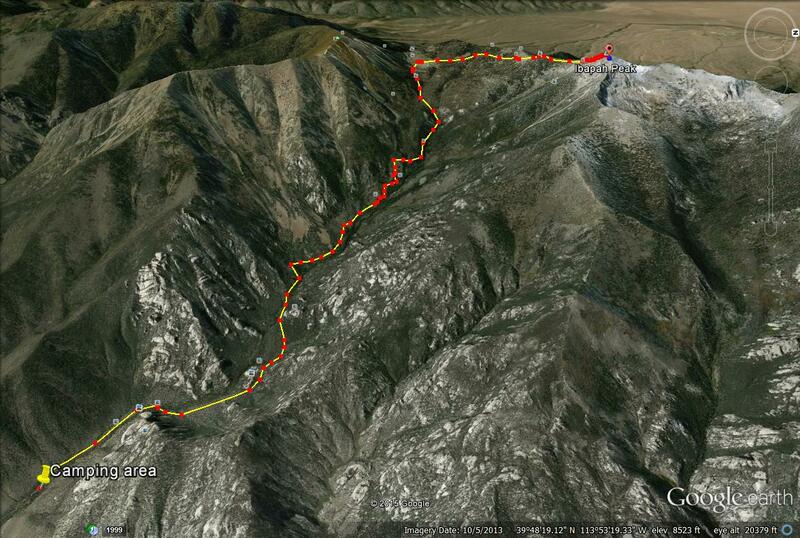 Anyhow, my main reason of posting is that in 2012, in preparation for hiking Mt. Whitney, I attempted to bag Ibapah Pk. I was able to drive my Jeep beyond the gate and up to a small turn around at the end of the road. There was an obvious and definite trail heading off the road's end. However, about a quaret mile in, if even that far, the trail disseminated into nothing. I walked back to the trailhead and started again. I lost it second time. I think I did this four times, but I was never able to pick up the trail beyond a certain point and I was wondering if perhaps they had stopped maintaining it. 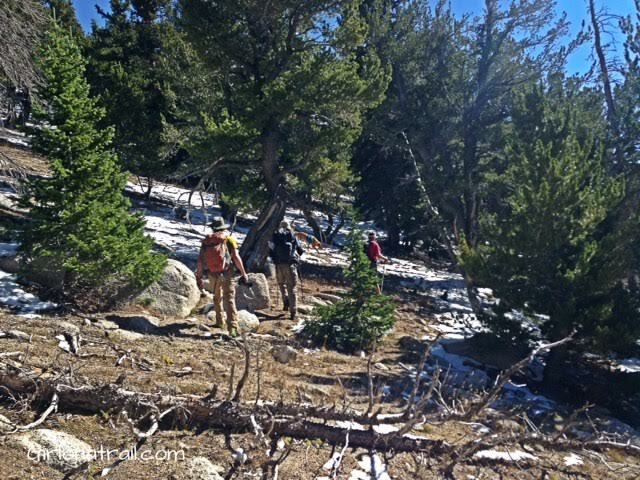 Then I read in a Sierra Club hike that they had made it to the dry meadow. I must have missed something somewhere. Perhaps I started at the wrong spot, because I definitely did not see a large rock cairn like you show in your photo. Perhaps I need to go back and try again. Another problem I ran into out there was a bunch of yahoos on 4-wheelers who kept buzzing my camp. Since I was out there all that way via the Pony Express Trail I figured I would camp out a 2nd night. But when they started shooting guns just over the short ridge from whee I was camped, I truly felt they were trying to intimidate me. Well, it worked, I packed up my gear and headed home. Anyhow, I would love to hear if you can tell me more about the trailhead and that rock cairn. Again, great blog. Your are a very courageous woman, and you have a wonderful dog. Say hi to Charlie. 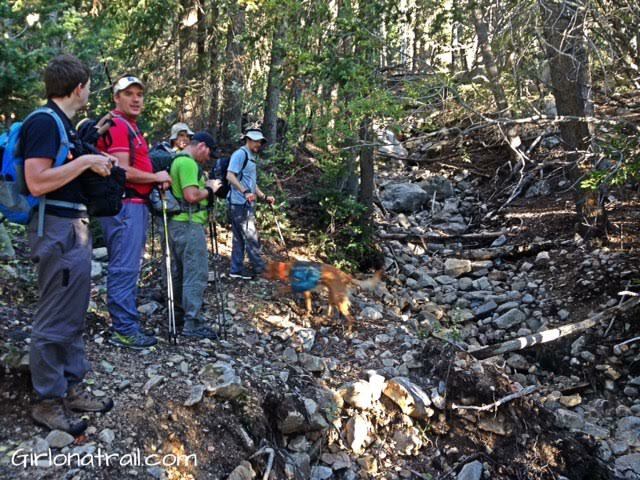 Keep on hikin'! Kudos on an excellent blog. I stumbled across this while researching Ibapah, and wound up reading plenty of other posts. Very nicely written, and just the right quality and quantity of information that I'm usually looking for. 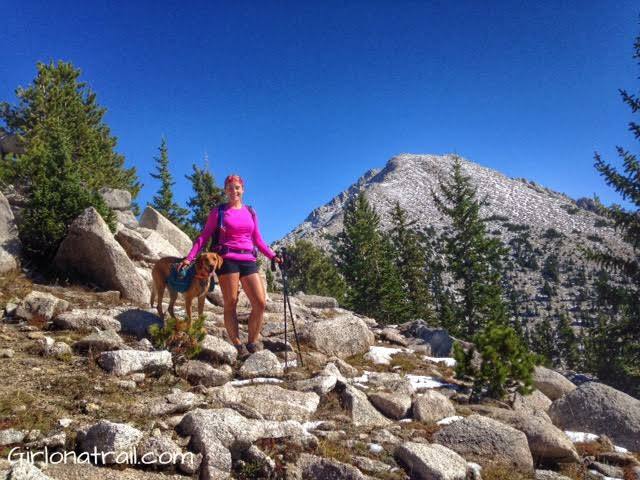 Hi Alicia, awesome blog and appreciate that you did one of the more useful and picture-friendly write-ups on this hike that i've come across! 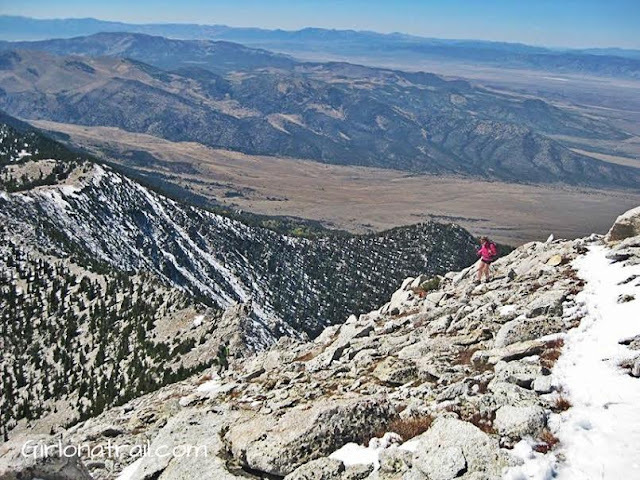 I'll be enjoying these mountains on a backpacking trip with my wife this year, and definitely getting up to Ibapah peak while we're out there. I had a logistical question, to the best of your memory, about how long was the ascent from the false peak to the summit at your pace? 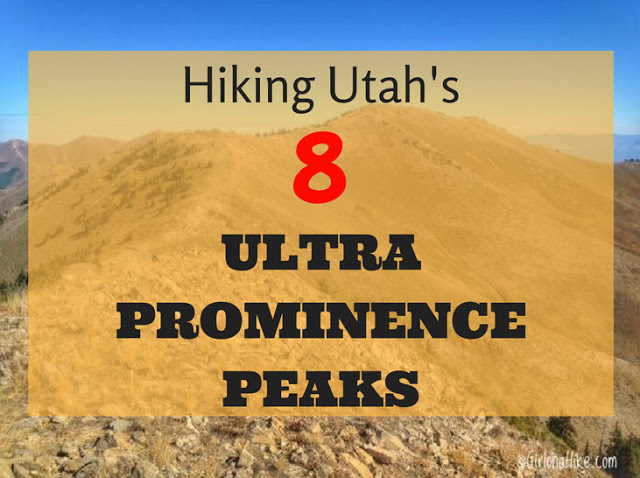 I'm hoping to do all or part of this hike as a day trip to scope around before backpacking in, but since you already have experience thought you would probably know the answer to that question, thank you have a good one! Howdy Alicia, nice to find this older post of yours (I enjoy reading your blog posts). Quick question, do you recall if the camping/trailhead area can be accessed if pulling a small travel trailer, or is definitely a rough drive in with just a car and then tent camping? Thnks! I would say yes, that you could. However, the last time I was out there was in 2015 so I'm not sure what road conditions are like now. The road wasn't too bad at that time. Good luck!